First rule is, just because the roll says its 56.4 square feet, don’t think that it will cover 56.4 square feet. 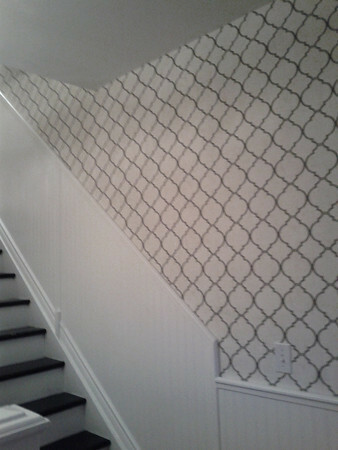 With any wallpaper installation there is wasted material that must be accounted for, even with a random match. Next rule of thumb is, most double rolls of wallpaper will provide 3 full strips on the wall, given a standard 8 ft ceiling. Therefore, if the wallpaper is 20.5” wide, a double roll will provide 61.5” of coverage on the wall. Lets take an example, say you want to know how many rolls of wallpaper for an accent wall that is 10 ft wide by 8 ft high. Some rolls of wallpaper are not 20.5” wide, 27” width is also common. Generally 27” wide wallpaper will still provide 3 strips on the wall, so your coverage would increase to 81” per roll. Conversely, some wallpaper with no repeat, or a very small repeat can yield 4 full strips of material, in which case less wallpaper is needed. Windows and door frames should be accounted for as they have the potential to decrease the number of rolls that are needed for the project. Feel free to contact us and we’ll crunch the numbers for you to ensure that you’re ordering the correct amount of wallpaper for your next wallpaper project.